Joyce Kilmer Memorial Forest near Robbinsville is a living memorial to writer/poet Joyce Kilmer, best known for the poem, “Trees.” Located by Lake Santeetlah in the Nantahala National Forest, it is about 100 miles west of Asheville (a two hour drive). 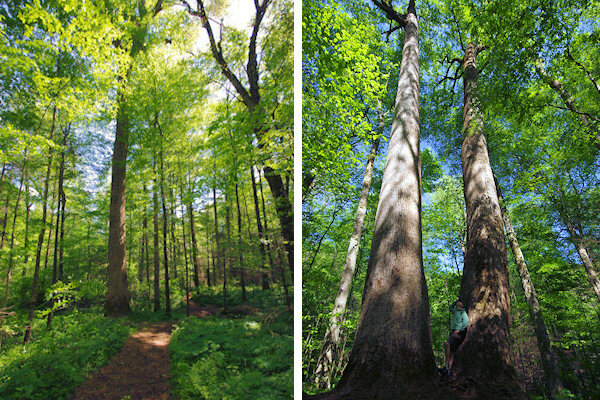 The Forest is a rare example of an old growth cove hardwood forest, an extremely diverse forest type unique to the Appalachian Mountains. Take a two-mile easy hike to see poplar, hemlock, red and white oak, basswood, beech and sycamore. Some are more than 400 years old and rise to heights of over 100 ft. and have circumferences of up to 20 ft.! 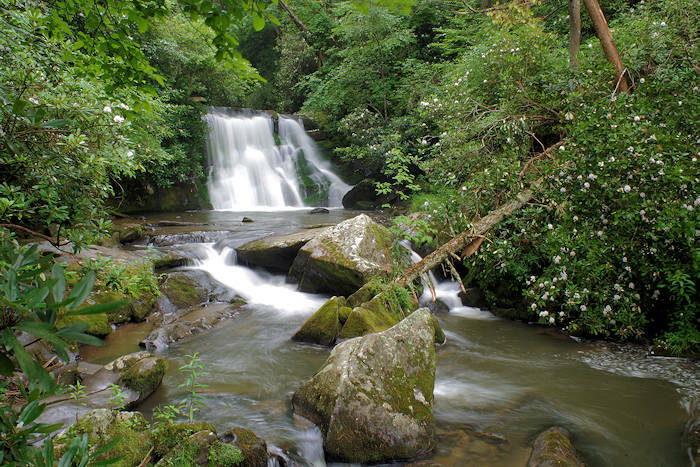 The 3,800-acre Joyce Kilmer Memorial Forest is now a part of the 17,000-acre Joyce Kilmer-Slickrock Wilderness, adjacent to the Great Smoky Mountains National Park. 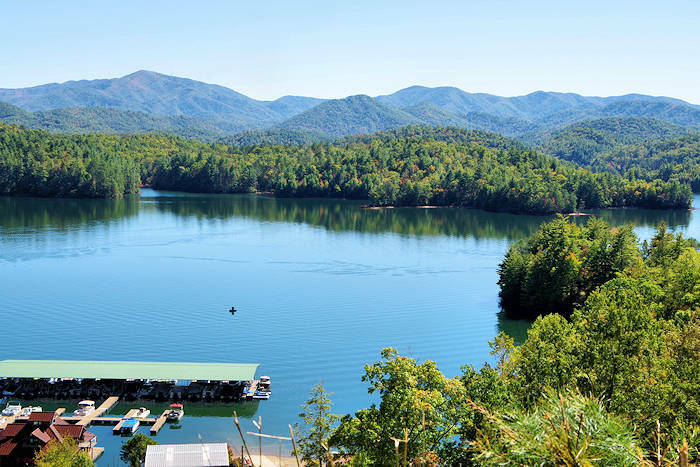 Nearby is Fontana Lake and the super-scenic Cherohala Skyway. 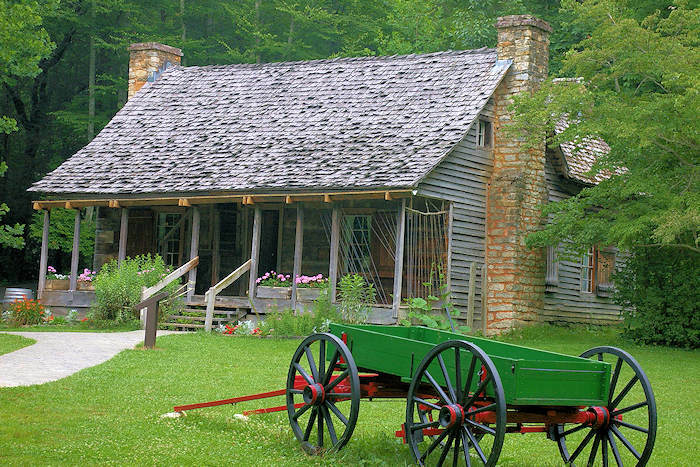 It's about 35 miles from the Nantahala Gorge & River whitewater rafting area. The only way to see the impressive trees is to walk through the forest on an easy two-mile loop nature trail. The trailhead is located at the far end of the parking area by the information shelter. There are two loops: the 1.25-mile lower loop passes the Joyce Kilmer Memorial plaque. 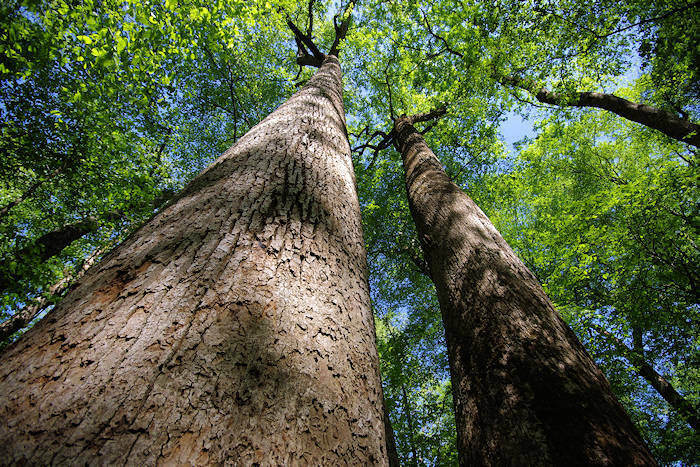 To see the big trees, take the upper 3/4-mile Poplar Cove loop for a grove of the largest trees. The trailhead parking area has a flush toilet and picnic tables. There are benches along the route where you can stop to admire this untouched forest. In addition to the trees, discover a big variety of shrubs, vines, ferns, mosses and other plants. In the spring, wildflowers take advantage of sunlight which will not be available after the hardwood trees are covered with shade-producing leaves. Rhododendron, mountain laurel and azalea bloom in the late spring and early summer. In 1934, the Bozeman Bulger Post of the VFW petitioned the U.S. government to find a suitable area to serve as a monument to Kilmer. An isolated pocket of old-growth hardwood forest within the Nantahala National Forest’s Cheoah Ranger District in western North Carolina was selected. While most of the surrounding land was logged, the area around Little Santeetlah Creek was spared, protected by a recognition of its uniqueness and the drastic drop in lumber prices after the "crash of '29." Unfortunately, hemlock trees in Joyce Kilmer Memorial Forest have become infested with a non-native invasive insect pest, the hemlock woolly adelgid. This aphid-like insect feeds on the hemlock’s sap. To enhance safety while hiking, forest rangers have felled many dead trees. As this is a wilderness area, the trees were taken down in a way that mimics the effects of wind or ice storms. Explosives were used to bring down the dead hemlocks instated of saws, so they appear to have fallen from nature’s forces. The stumps and logs were not removed, but left to decay naturally. You will see several large dead hemlocks still standing. Joyce Kilmer Memorial Forest is located about 100 miles west of Asheville, 15 miles from Robbinsville in the western part of Graham County adjacent to Lake Santeetlah. From Robbinsville, take Highway 129 north for 1.5 miles to the junction with Highway 143 west (Massey Branch Road). Turn left and proceed west on Highway 143 for approximately 5 miles to a stop sign. Turn right onto Kilmer Road. 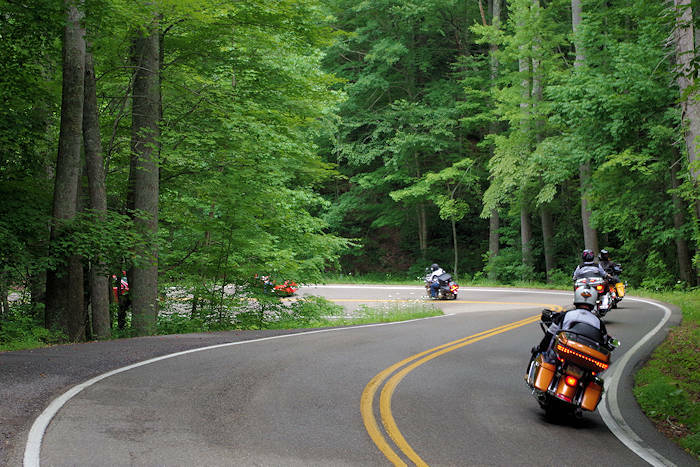 You will drive for about 7.3 miles and arrive at the top of Santeetlah Gap and the junction with the Cherohala Skyway. Bear to your right and continue on for another 2.5 miles to the entrance of the Joyce Kilmer Memorial Forest. Turn left into the entrance and it is about 1/2-mile to the parking area. There are picnic tables, grills and restrooms. Joyce Kilmer Memorial is part of the wilderness area that covers 17,000 acres in North Carolina and Tennessee and provides an example of primitive mountain area. Like other wildernesses, Joyce Kilmer-Slickrock is managed to protect naturalness and solitude. Trails are minimally maintained with no blazes (marked trails) allowed. Small, unobtrusive wooden signs are located at trail junctions, but hikers must know how to read maps and use a compass to traverse the area. It is quite rugged, with few opportunities for off-trail travel. 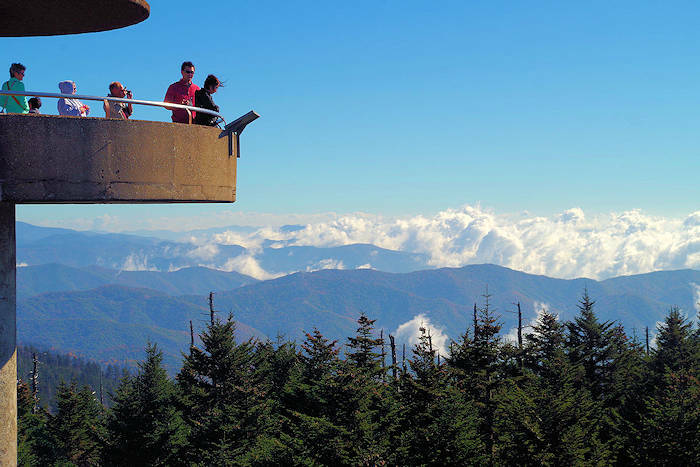 Another great hike nearby is the trail from the Cherohala Skyway to the top of Huckleberry Knob (read more).